There are a lot more cool tools out there for pets and their miscellaneous healthcare needs, but these are the ones I tend to recommend most frequently. Cats and dogs need these to protect their head, face and ears after surgery, and when they are licking or biting their bodies to the point of damage. But one size does not fit all, and a combination of these approaches may be necessary (e.g., cone plus T-shirt), and there are zillions of them on the market. Sometimes, trying out several types (especially if you live with a Doberman) is a necessity. I adore booties! Several varieties are available on the market and they serve varying purposes. Here in Miami, where we have no snow, the main objective is to protect dogs’ pads from the heat of the asphalt and to keep them from slipping on tiles floors as they age and lose strength and coordination due to osteoarthritis. I recommend no-slip, and you can go with the heavy-duty cold-weather variety or the rubber wet proof variety. Either way, I recommend night-time removal for safe skincare. 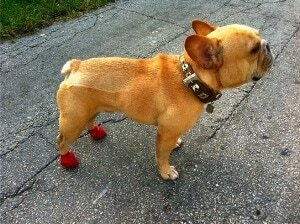 Anyone who uses booties on their dogs needs to look out for blisters and ulcers. Though I strongly recommend them for protecting older dogs who might slip on our ubiquitous Florida marble and tile floors, I’m very careful to make sure their owners don’t leave them on 24/7. I’m a convert. 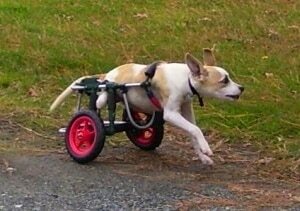 After the uncomfortable head halter boom of the last 15 years, we were due an easier model for canine tractability. Dogs respond amazingly to it — without the pinch collar pain or head halter whiplash. It’s not for everyone but it’s worth looking into. 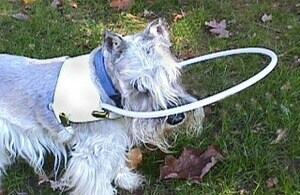 It keeps blind dogs from bumping into things with their heads. It’s a small market, for sure, but what a great idea! The manufacturer of The Littlest Angel Vest makes these cool contraptions by hand. I’ve never seen anything like it and it really impresses me to know she devised this for her own dog’s comfort — even more so that she offers them (handmade!) for under $35, because she says, she knows how much people have already spent on vet bills. (I suggested she change her prices to a sliding scale – low end for those who can’t afford it and up to $100 for those who can – to reflect the amount of hard work and care she puts into this project. But beware: She’s got a waiting list and she hates to disappoint. So be prepared to cool your heels while she works her magic. I know there are many more products out there. Now it’s your job to convince me that your choices deserve to be on the list, too. What top healthcare tools have you used? Note: Today’s post was originally published in February of 2008 on Dr. Khuly’s former blog, Dolittler. 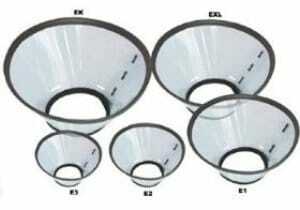 I’ve been forced to use the “cone” a couple of times. No fun for the poor dogs. They hate them. Wow, this is the first time I have seen the “Cane” for blind dogs. What a great idea! Booties are normally used for snow, as you say, but I have never known them to be used for hot pavement, being from the Northwest. Another great idea.